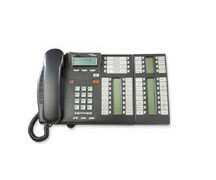 Business Series Terminal T7316E + T24 KIM T7316E+T24 KIM (CAP) As the M7324+CAP replacement, the Nortel Business Series Terminal Central Answering Position (BST CAP) embodies the same high quality, flexibility and expandability you have come to expect from Nortel. It is ergonomically designed to ensure administrative assistants, receptionists and emergency contact center personnel distribute calls more efficiently. By attaching up to four T24 Key Indicator Modules (KIMs) directly to a T7316E, users can elevate their operations while maintaining exceptional customer service. The result is an elegant desktop telephone solution ready to transform the pace and efficiency of any business operation while maintaining exceptional customer service standards. Key Features: * Modular design: Whether functioning as a feature-rich standalone solution or as a Central Answering Position, the BST CAP’s modular design allows strategic deployment based on business requirements. * System powered: Reliability is improved and installation simplified by removing the auxiliary power supply and utilizing the Business Communications Manager (BCM) or Norstar system to power the BST CAP. * Busy lamp field/Direct station select: Increases customer satisfaction while improving operator efficiency by utilizing multi-segment icons for accurate and efficient routing of customer inquiries. * Audio control center: Simplifies telephone operation by clustering common audio features for fast and precise toggle action between handset, headset, and speaker. * Multiple hunt groups on the T24 Key Indicator Module (KIM): Ensures real-time contact by providing a series of telephone lines organized in such a way that if the first line is busy, the next line is hunted until a free line is found.